Excellent quality and convenient portability make this set a great value. Twenty-four brilliant pans of watercolor are neatly stacked in four interlocking trays. The trays are topped with a crystal clear plastic lid that can also be used as a mixing tray. Each tray measures 3-1/4" (8 cm) in diameter. 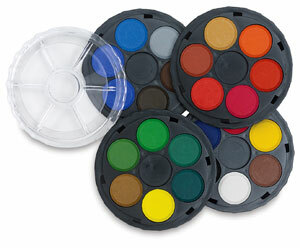 The individual watercolor pans are each 7/8" (2 cm) in diameter.